Karen Nye, the creator of the Little Somethin’ Jacket, has now created “One Great Jacket” – and truer words have never been spoken! This new pattern is due later this month and is sure to be a winner! 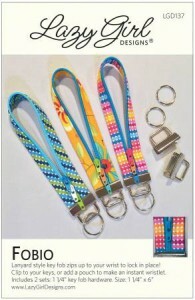 The pattern includes three different variations in multiple sizes. And look what a difference in the fabric can make! The simple fit of all of the CNT garments makes it easy to fit AND easy to sew! 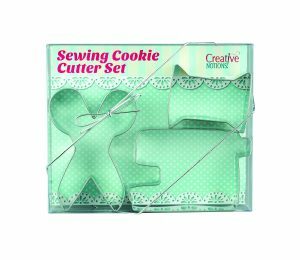 This cookie cutter collection #CNCCS is great this time of year when everyone is making sugar cookies – but are great year round for all of those quilting events. 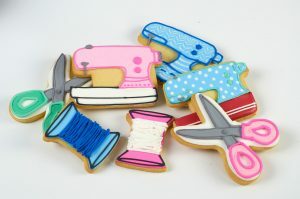 These gift items designed by Lori Holt are adorable. 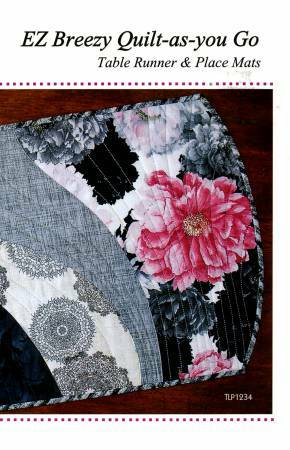 Start dreaming – and organizing your next quilt project. This calendar #ST-4150 starts whenever you want it to! Or, decorate your fridge or machine with this magnet set #ST-4150. 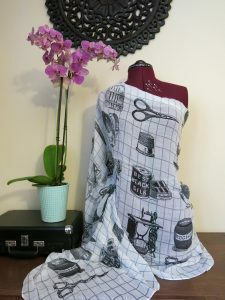 This beautiful scarf #SCARFVICT can add a touch of class to any quilter. Go through your store and pull out other items that should be placed center stage for those seeking last minute gifts. 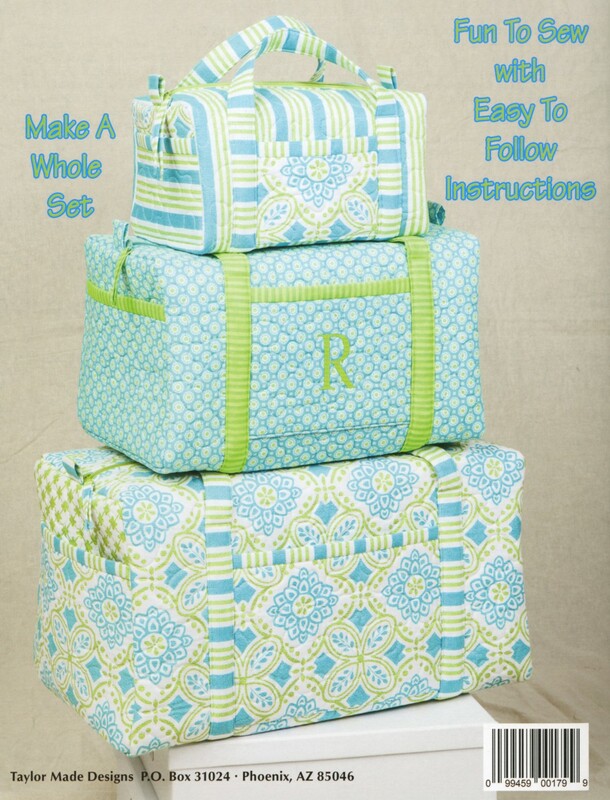 Your customers may be surprised that you have more than fabric! These latest fashions released by Indygo Junction are sure to become classics! They all come in multiple sizes – and in two lengths to flatter any figure. Just in time for summer, this Asymmetrical Tank & Tunic (#IJ1149E) features a classic wrap design – no buttons or zippers required. Simply finish by top stitching the edges. The short length hits at the lower hip; the longer length hits at mid thigh. Choose the length that works best for you. This top will drape well in cottons, batiks, as well as the rayon fabrics that are gaining in popularity. This simple top can be made in an afternoon and would be a great beginning class. This classic tank reminds me of the 70’s. The front neckline features decorative mini pleats which gives it a sense of style and drapes beautifully. 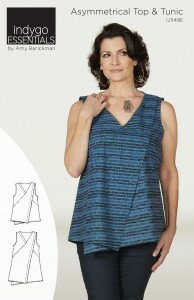 The neckline and arm holes are finished with bias – once again no buttons or zippers required. And, once again, it is available in two lengths – just below the waste and mid-hip. Choose the length that is most flattering for your body type. This Everyday Tank (#IJ1147) is also available in multiple sizes from XS to 3X. This Swing Jacket (#IJ1141E) features beautiful back detailing. 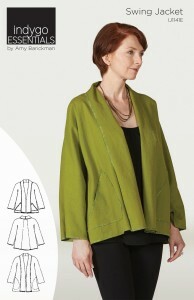 Construction is easy since it has dolman sleeves and no closures. The tuxedo collar extends the entire length of the jacket which is available in mid-hip or mid-thigh length. Serge the edges for a simple finish – eliminating the need for facings and hems – or choose a traditional finish with a lined collar, facings and inseam pockets. Once again it is available in multiple sizes. 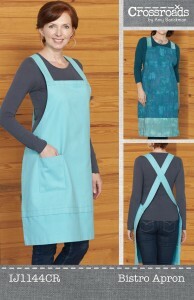 This Bistro Apron (#IJ1144CR) features crisscross straps and optional pockets – no ties required. Two strap lengths and two apron lengths make it a must have for everyone. This classic comes in multiple sizes from XS – 2X. 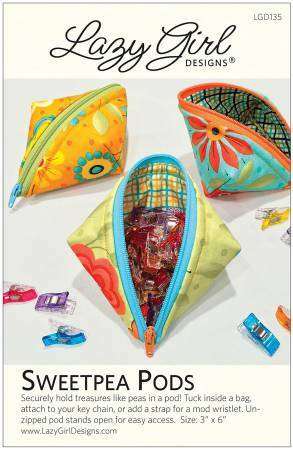 Pockets are optional – but who wouldn’t want them? To see the complete collection, visit our website: Indygo Junction. 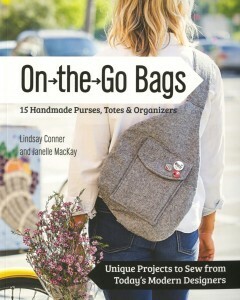 Over 25% of the top selling patterns are purses and now three of the top 100 books feature purses as well. Why? Personally, I think it is because the products have caught up with the industry. 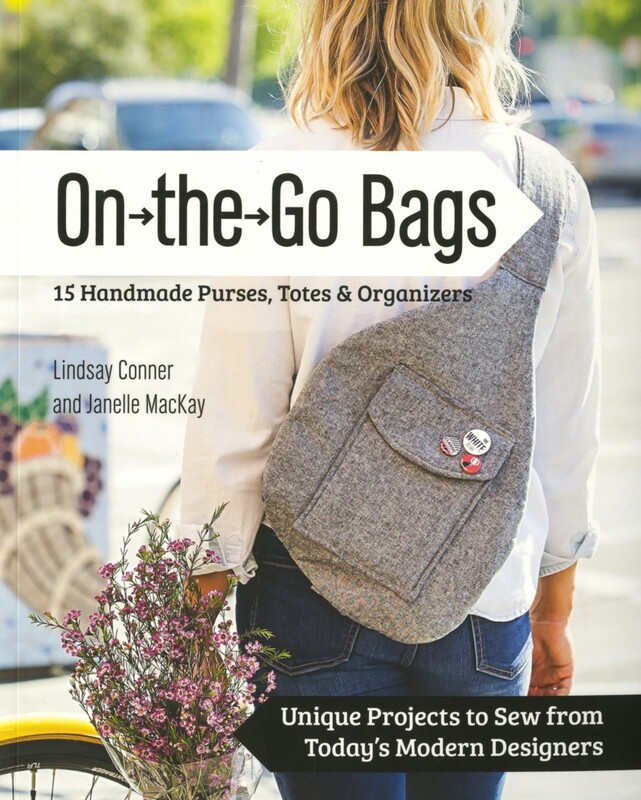 With the likes of products such as Soft and Stable, mesh, vinyl and hardware, anyone can create professional looking designer bags. 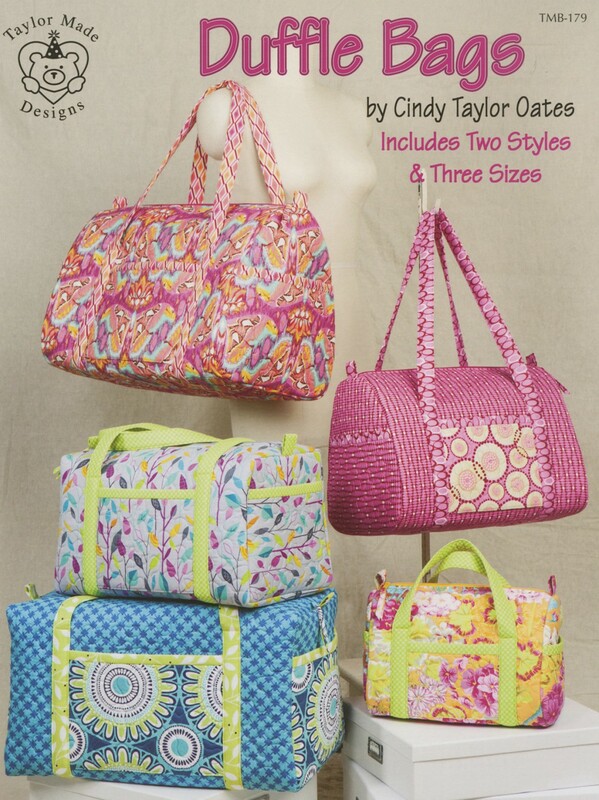 Two styles of bags come in three different sizes. Sara Lawson has created twelve structured bags for her book, Windy City Bags. 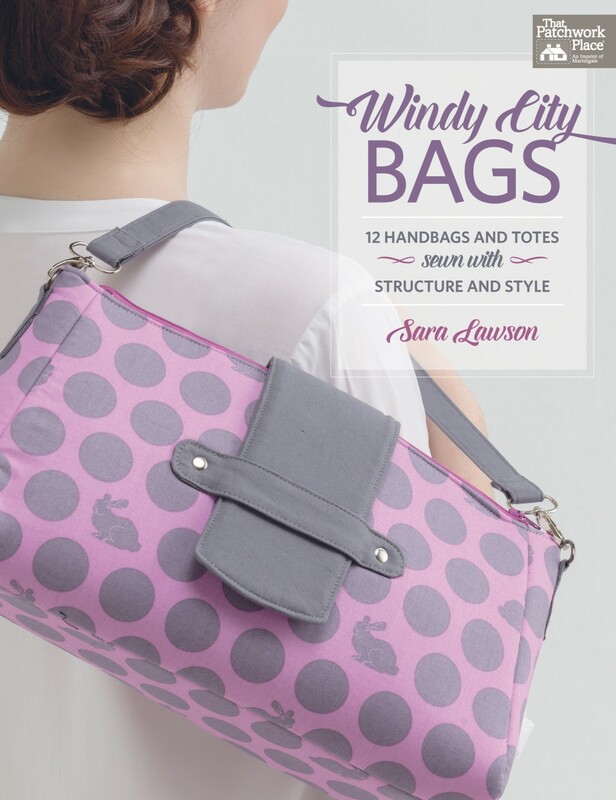 Sara explains how to confidently choose the correct interfacings and how to personalize your design with fabrics, hardware, zippers and pockets. Choose from any of a dozen top notch designs. Remember, quilt shops are no longer just for quilts any more! 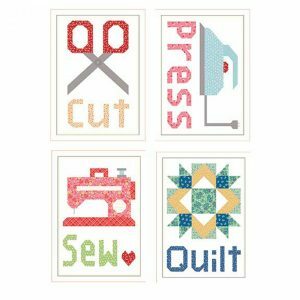 If you truly are just a “quilt shop”, you are missing a wealth of business! 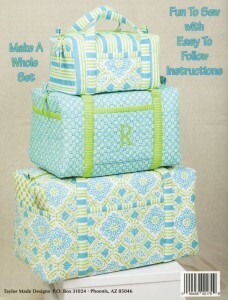 Over 80% of the top 100 patterns on the Checker website are NOT quilts. Creating a quilt is an amazing experience but everyone wants instant gratification. Why not offer a series of classes that can actually be completed in class? 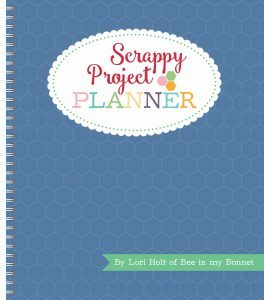 And, as a bonus, choose projects that make great gifts as well. Make one in class, and then send them home with the supplies to make them for all of their friends! This apron pattern is one of my favorites. 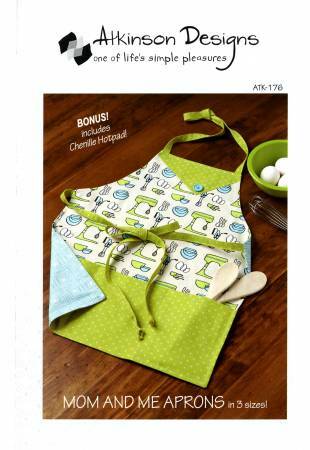 It comes in two sizes so kids can have fun in the kitchen as well…. 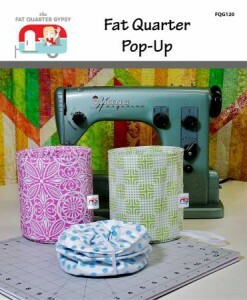 These Sweetpea Pods can be made with 10″ squares. Talk about easy to kit! 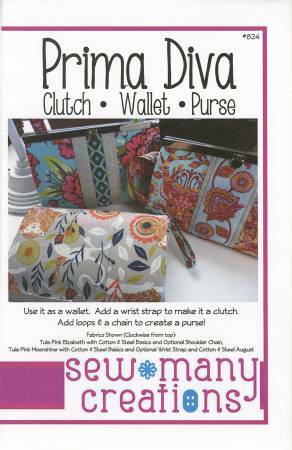 It just takes a fat quarter – and the hardware is included in the pattern! How easy is that??? This is the new version of he classic Diva Wallet. Choose a different option – with the same great clasp. 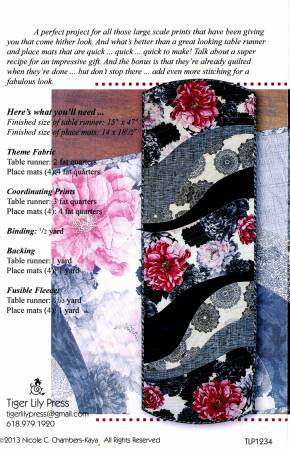 This placemat or table runner has a classic look and is quilt as you go! 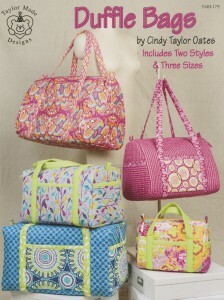 You can make ALL of these samples in the amount of time it would take to make ONE quilt sample! Use your time wisely. Don’t forget to take the time to display all of the companions with the projects and include pre-cuts!